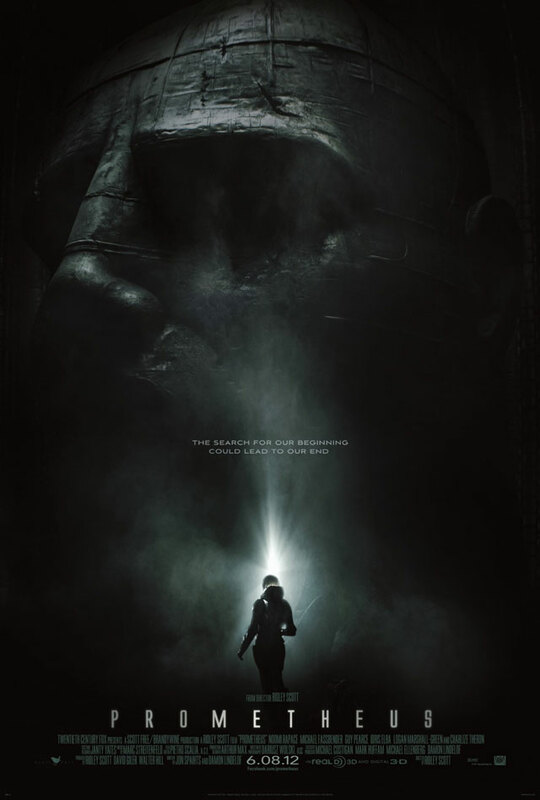 PROMETHEUS is a visually stunning, beautifully acted film that makes absolutely no sense. Apart from a couple of obligatory gore-fest alien-parasite-attack scenes, there's no sense of creeping menace. No fear that in space no-one hears you scream. Instead, we get two hours of an attempt at a deep philosophical discussion of faith versus science, creators versus created. Tragically, the writers simply do not have the intellectual chops, or the focus, or the respect for the audience to see it through. The result is a movie that plays more like a drama than a thriller, and certainly doesn't play like horror. A film that frustrates far more than it entertains. I didn't watch LOST myself, but I know enough frustrated fanboys to suggest that the blame for this missed opportunity sits firmly on the shoulders of Damon Lindelof, the script-writing genius who also messed up with COWBOYS & ALIENS last year. The movie kicks off in the not too distant future, around 200 years before the events in ALIEN. A private corporation has sponsored a scientific mission to a planet who's co-ordinates have been painted in prehistoric caves. The scientists Shaw and Holloway (Noomi Rapace and Charlie Holloway) believe they are going to discover the creators of humanity. The crew, helmed by Vickers (Charlize Theron) just want to get in and out quickly. All but the slippery cylon, David (Michael Fassbender) who has an agenda that is never really explained in the course of the film. Naturally the crew land on a planet which was once apparently peopled by a race of creators, or "engineers", who have since been wiped out by the aliens we all know and fear. All of which begs several questions. Do the engineers mean humanity well? Does David mean humanity well? Were the aliens a messed up experiment that got out of hand? Who created the aliens? And who created the engineers? All of these questions will apparently be answered in a sequel, but frankly, do we care? This movie, with its superb performances (particularly from Rapace and Fassbender) and beautiful landscapes (Darius Wolszki) could've been astoundingly good, if only it had been more focussed in exploring its themes. For instance, if David is inspired by Lawrence of Arabia, then let's take that further. Lawrence is a fascinating character with very specific notions of the interaction between the rulers and ruled, which could've been used here. If Shaw is a scientist exploring creation who refuses to give up her faith, let's really explore the provocative inconsistencies there. If David is going all HAL, let's explore that, And if Vickers is really going to have a relationship revelation near the end, let's explore that rather than just tossing it into the mix for a nanosecond. So, basically, worth seeing for the visuals and the acting, but utterly, utterly frustrating. PROMETHEUS is on release in the UK, Belgium, France, Switzerland, Azerbaijan, Belarus, Bulgaria, Chile, Denmark, Israel, Kazakhstan, the Netherlands, Russia, Ukraine, Armenia, Finland, Norway, Ireland, Sweden and Turkey. It opens on June 7th in the USA, Greece, Hong Kong, Iceland, Indonesia, Serbia, South Korea, Taiwan, Australia, Croatia, Hungary, Kuwait, New Zealand, Portugal, Singapore, Slovenia, Canada, Egypt, Estonia, India, Lithuania and Romania. It opens on June 15th in Argentina, Brazil, Colombia and Mexico. It opens on June 22nd in Vietnam, on June 28th in Cambodia, on July 20th in Poland, on August 9th in Germany and Spain, and on October 19th in Italy.